Rulan’s work values movement as an expression of indigenous worldview, including the honoring of matriarchal leadership, dance as functional ritual for transformation and healing, the process of decolonizing the body, and the animistic energetic connection with all forms of life on earth. 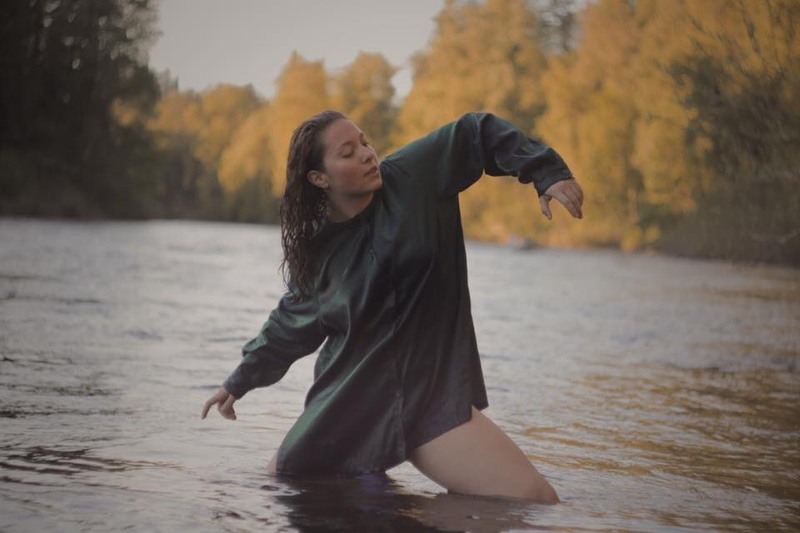 Of mixed Kampampangan/Norwegian and hunka Lakota heritage, she has recruited and nurtured a new generation of Indigenous contemporary dancers and holds the belief that "to dance is to live, to live is to dance". Raven is Native American from Gallup, New Mexico that grew up within the Hip-hop community. My roots come from the blood of my families but also from the heart and soul of the communities I am a part of. Olivia Camfield (Mvskoke Creek) was born and raised in the Texas Hill Country. She trained in Limon under Joe Alegado in San Antonio TX and is currently a Company member with Dancing Earth under the Artistic Direction of Rulan Tangen. In Olivia’s personal work she focuses on the intricacies of mixed-indigenous identities, promoting indigenous futurism, and the continued education of all settlers on the systematic erasing of native womxn, languages, sacred sites, and ancestral lifeways. Justin is a dancer, model, and aspiring actor based in Colorado, of Navajo, German and mixed heritage. 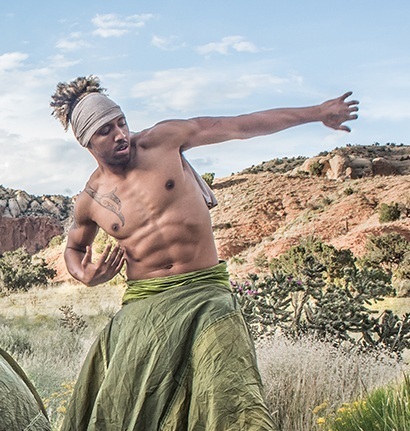 He became a member of Dancing Earth in 2014, joining the Summer Institute and a show called SEED with 60 community members in Four Corners area, later touring with Seeds Re Generation to Canada, Guahan and O’odham and Ute territories in US. with Dancing Earth’s recommendation, he was cast in TV series Jamestown which filmed in Europe, and in ‘The Atomic Opera’ with director Peter Sellars at Santa Fe Opera. Deollo has been studying martial arts and dancing for over 30 years, practicing and performing a wide range of dance and movement styles and a variety of combat systems. He has an extensive teaching background with a wide range of ages and skill levels, including teaching capoeira as an adjunct faculty member at Meredith College in Raleigh, North Carolina, as well as at the American Dance Festival, at Payap University (Chiang Mai, Thailand), and the Haiti Baptist Mission. 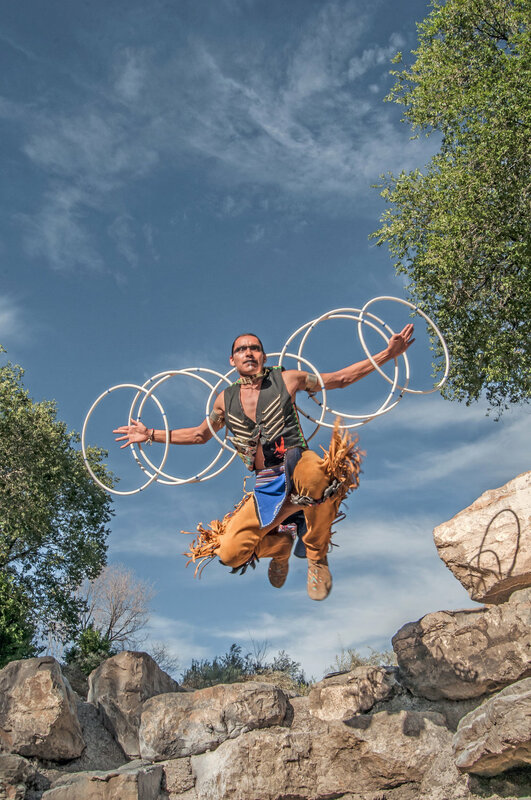 Deollo has been a core dancer with Dancing Earth since 2007, additionally contributing as rehearsal assistant, spoken word artist, percussionist, lead teacher for our year round cultural creative movement program in Cochiti Pueblo, and aerialist. 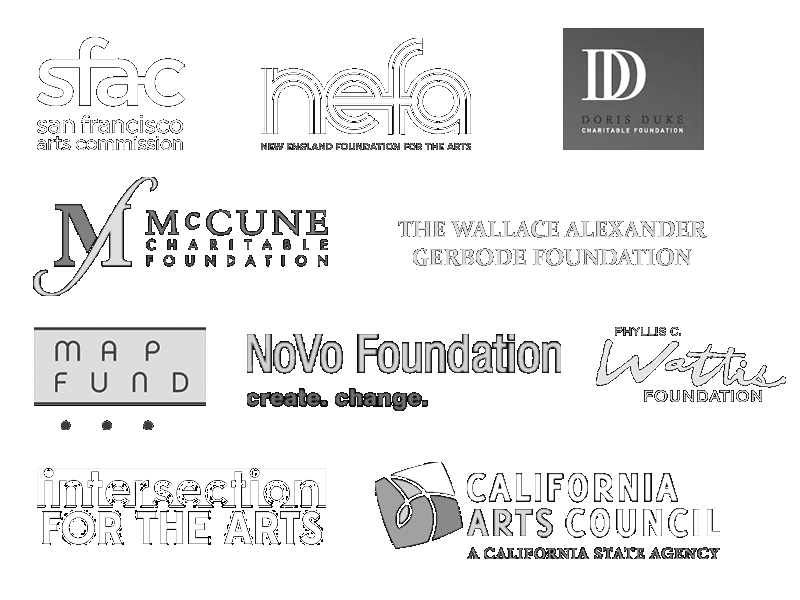 Holds a masters from UC Davis and is an international performing artist, producer, dramaturge, activist, and educator. Her practice spans theatrical forms that focus on spectacle based physical theatre, contemplative movement based performance and site specific installations. Anne is Jicarilla Apache from Dulce, New Mexico. She was raised traditionally by her family on the Jicarilla Apache Reservation where she grew up with an intrinsic connection among self, land, and culture. She has been dancing her stories with Dancing Earth since 2012. Eugene Pickett III aka "Trey" born in Altadena, California now resides in Albuquerque New Mexico. He comes from a performing family and has 20 years of experience. He is of mixed heritage(West African,Cherokee,French, Irish) and shares love and culture through the arts. Lumhe Sampson (of the Sampson Bros. Lumhe & Samsoche) is world renowned for his innovative and unique collaborative style in hoop dance exhibition. Symbolizing the connection and emphasizing importance in unity of all things in this world, their unique performance invigorates the mind and brings harmony to ones soul. The Bros. have been teaching and sharing the art of Hoop Dance for over 25 years throughout Turtle Island and beyond. 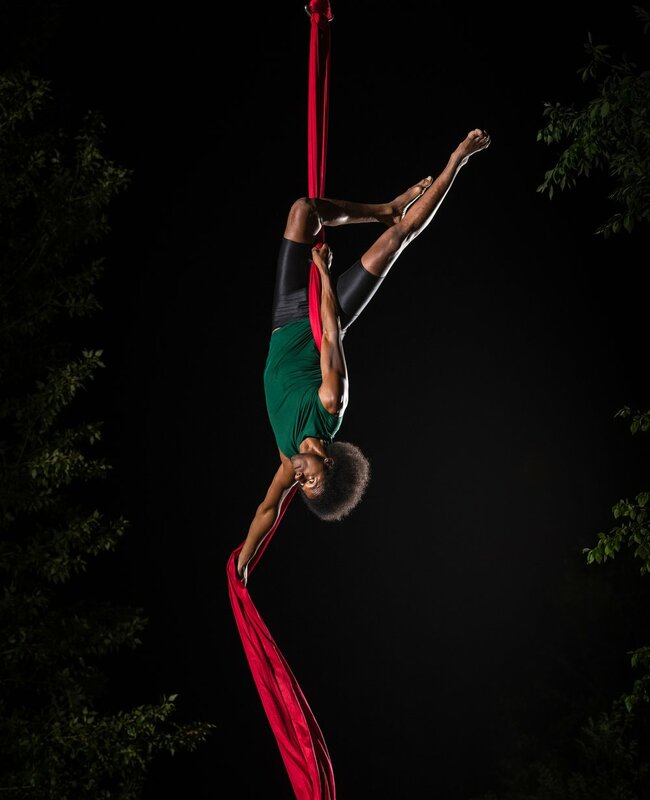 Samsoche Sampson is a traditional/contemporary dancer specializing in Grass, Fancy, and hoop. In addition blending traditional styles with modern influences creating a dynamic fusion. Esmé Olivia is a performing & teaching artist grateful to have grown up in occupied Tiwa Pueblo lands known as Albuquerque, NM to a Mestiza Mexican-American mother & Dutch father. Her blood is a peace treaty she honors through prayers of dance, poetry & song. Listen, look and learn more at EsmeOlivia.com. Natalie practices many disciplines rooted in the healing arts, wellness and personal development; her facilitative work is rooted in cyclic universal dance and the infinite sacredness in all life. Natalie focuses on the potency of collective illumination and our shared spiritual and physical potential to create magic for ourselves, others and earth. She supports all walks of life form their own unique healing, follow their natural rhythms and create maintainable balance. Natalie Benally is a Dine, Zuni, Ute and Mexican woman who holds a Bachelor’s degree in Theater- Performing and Directing from Fort Lewis College. She has been performing dance and theater for the last 10. She studied at the Dancing Earth Summer Institute and joined the company for touring of US and Norway. Some of her most notable work includes lending her voice to the lead role of Dory in the Navajo dubbed version of Disney/Pixar’s Finding Nemo and directing/choreographing a devised production entitled "I'm Native And..." for Fort Lewis College inaugural Indigenous Arts Festival. Natalie works as the Indigenous Programs Coordinator for the non-profit organization, Girls Incorporated of Santa Fe. Fernando Miguel is a performer and a visual artist. Born and raised in South Central Los Angeles, he has been living in the Bay Area for nearly a decade. He comes from the Q'anjo'bal Nation of the Mayan people of the Western Highlands of Guatemala. 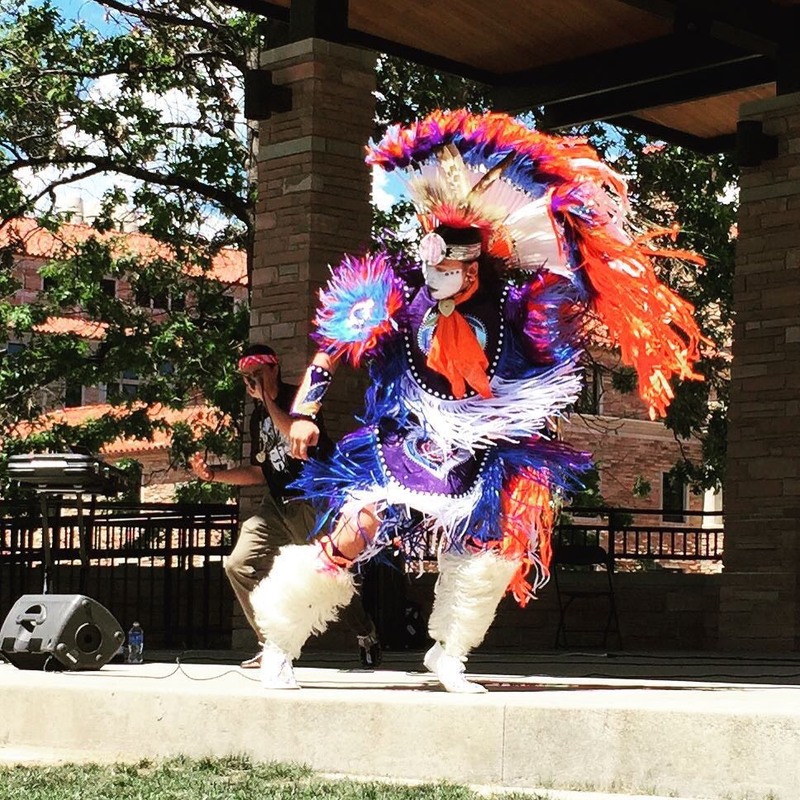 Dance, culture and art inspires Fernando! Lupita is a farmer and performing artist from the mountains of northern New Mexico. She has returned to her family’s farm, and is working as a Agricultural Programs Director with the Northern Youth Project, as well as teaching theater with Moving Arts Española, and as a performer with Dancing Earth. At present she is working to find balance between working the land and telling the stories that need to be heard.